CEDAR CITY – The Trump administration recently rolled back limits on a program to provide surplus military gear to law enforcement agencies, a move local police support. President Barack Obama limited the program in 2015 amid public outcry over how police were using the equipment during protests in Ferguson, Missouri, over the fatal shooting of 18-year-old Michael Brown. Obama’s executive order prohibited the transfer of a host of equipment, including grenade launchers, armored vehicles, camouflage uniforms and high-caliber weapons. U.S. Attorney General Jeff Sessions, however, said the restrictions went too far. Sessions addressed Trump’s policy change Aug. 28 while speaking at the national convention of the Fraternal Order of Police in Nashville, Tennessee, where he received multiple standing ovations. “We are fighting a multi-front battle: an increase in violent crime, a rise in vicious gangs, an opioid epidemic, threats from terrorism, combined with a culture in which family and discipline seem to be eroding further and a disturbing disrespect for the rule of law,” Sessions said. Trump’s executive order “will ensure that you can get the lifesaving gear that you need to do your job and send a strong message that we will not allow criminal activity, violence and lawlessness to become a new normal,” Sessions added. Civil rights groups blasted the changes, calling for an end to the 1033 program they argue “militarizes” law enforcement. But like the National Fraternal Order of Police, who applauded the news of Trump’s executive order, many Southern Utah law enforcement agencies support Trump’s action. “I support anything that is going to allow me to get my guys home safe at night and a lot of this equipment helps keep my deputies safe and gives us more resources to work with,” Iron County Sheriff Mark Gower said. Both Washington and Iron County Sheriff’s Offices own Mine-Resistant Ambush Protected vehicles they obtained through the 1033 program. Likewise, the Department of Defense transferred two MRAPs to Cedar City and Hurricane Police Departments. 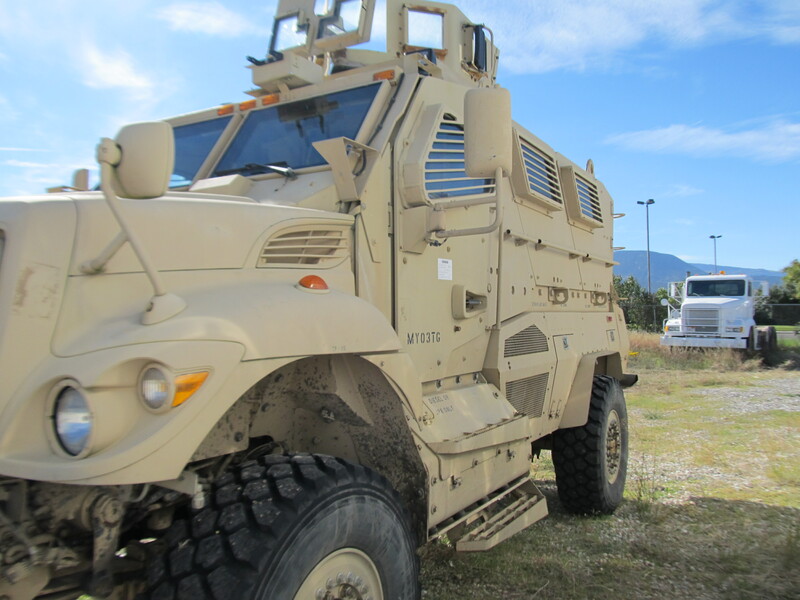 Iron County and Utah Highway Patrol were among the first agencies in Utah to start the MRAP trend in 2013, with more following suit over the next few years. 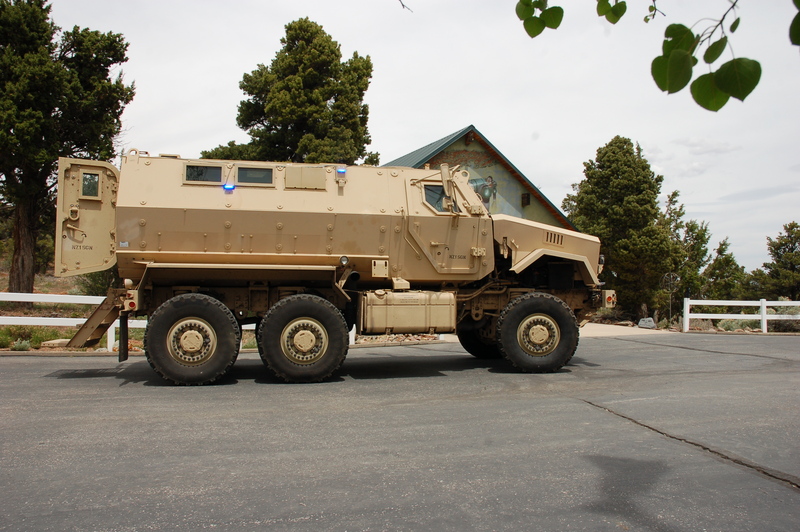 Cedar City Police Department added the MRAP to its fleet in 2014, while Washington County Sheriff’s Office only recently obtained its armored vehicle last year. 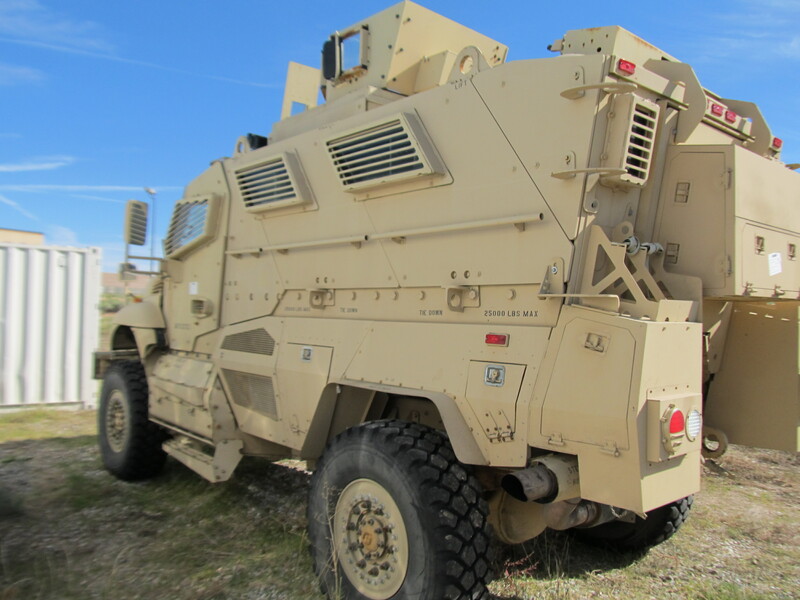 MRAPs obtained by Utah agencies ranged in cost from $412,000 to $733,000. According to records from the Defense Logistics Agency, which facilitates the program, St. George Police Department has not received any equipment from the 1033 program. Several departments throughout the state have also received assault and semi-automatic rifles. In Iron County, 12 assault rifles have been handed over to various agencies including the Cedar City Police Department that received its high-powered weapons in 1998. Womack said the department has since retired them. The program provides more than MRAPs and rifles. Records from the Defense Department show Utah police have been given medical gear, emergency blankets, camera equipment and a variety of other merchandise often found at a local hardware store. Equipment that can be used only a few times or that can get soiled are given to law enforcement, but weapons and vehicles are considered on permanent loan. The agencies must account for the items and keep them in working order. No weapons have been issued to any Utah police force since January 2015 when South Jordan police received 10 M16 rifles, DLA records state. Since then, Utah agencies have received other types of hardware and equipment. Official reports show that law enforcement in the state have received nearly $9.7 million in equipment since the program started in 1998. More than $5.4 billion worth of equipment has been transferred to agencies across the country. Much of the recycled gear would be unaffordable to local law enforcement without the 1033 program, Gower said, adding that the equipment offers law enforcement more “tools” to do its job. Cedar City Police Sgt. Jerry Womack echoed similar sentiments. “It gives us another tool we have in our bag to be able to do our job safely and to make sure the citizens are safe and those two things are our primary concern – keeping the officers and the public safe,” Womack said. Beaver County Sheriff Cameron Noel has not received any military gear in his county but said he supports the program, recognizing the need for such equipment in some incidents. He pointed to the Feb. 28, 1997, North Hollywood shootout between the Los Angeles Police Department and two bank robbers wearing body armor. The police were firing a few 12-gauge shotguns and pistols, and could not penetrate the suspects’ body armor. Eleven police officers and seven civilians were injured. In September 1997, the Pentagon sent 600 M-16s to the LAPD. While agreeing with his professional peers, Lt. Del Schlosser has another perspective on the issue. The Iron County Sheriff said he has no plans to mount a machine gun in the turret of the MRAP, nor will he ever use it to serve just any search warrant. Gower has only used the armored vehicle twice. The first time was in 2014 when the sheriff’s office pulled the MRAP out during a five-hour standoff on Interstate 15, in which the armed suspect had been sought in an arrest warrant for a Louisiana killing. At the time, Zeland Adams, 28, was holding an infant hostage in his car. He later surrendered and safely released the boy. Likewise, Cedar City Police Department has only used their MRAP on rare occasions, Womack said. cops don’t need mraps. They were designed to resist mines and ied’s. They’re too slow and heavy to have any practical purpose outside a war. They are a simply a toy for police at the expense of our tax dollars. They like to run around pretending they are military. Sometimes it borders on the ridiculous. It’s a lot funner for them to play GI Joe than do actual needed police work, like… traffic. Anything that empowers police to protect the safety and peace of our citizens is welcome. Military weaponry would have kept the protesters at bay in many locations where peaceful demonstrations turned into mercenary violence from the Left.